Magnets attract to a steel surface, but they don’t exert a lateral or sideways magnetic force. Only friction prevents your fridge magnets from sliding down to the floor. With that in mind, we’ve introduced a series of rubber coated mounting magnets made especially for hanging stuff on walls. Currently available in three sizes, they can be mounted with common screws or hardware. 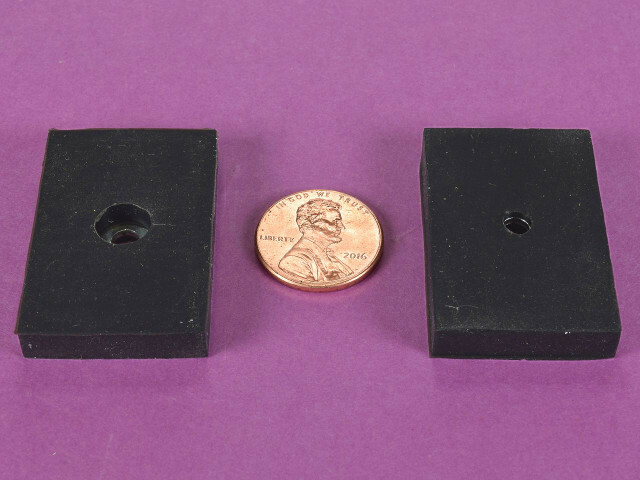 Our advice has usually been cautious and a bit technical, since it's hard to predict how a magnet might slide on a surface. Of course, if you’re just trying to hang a picture frame, you might not want to chat endlessly with our engineers about friction coefficients. They’re apt to, if you let them! You really just need a solution that works. So: Rubber Mounting Magnets. What makes these magnets different from simple block magnets? A slice with a razor helped remove half of the rubber molded around the magnet, providing a nice section view. These magnets are made with a thin steel plate that has two strong neodymium magnets attached. With a mounting hole in the middle, the whole thing has a rubbery material molded around it for a high-friction surface. These magnets are made for vertical wall applications! Their construction makes it easy to mount with a screw, and provides a lot of magnetic force for the amount of magnet material used. How do I use them to hang a picture? Magnet attached with a wood screw, above. ...to make a nice picture hook. 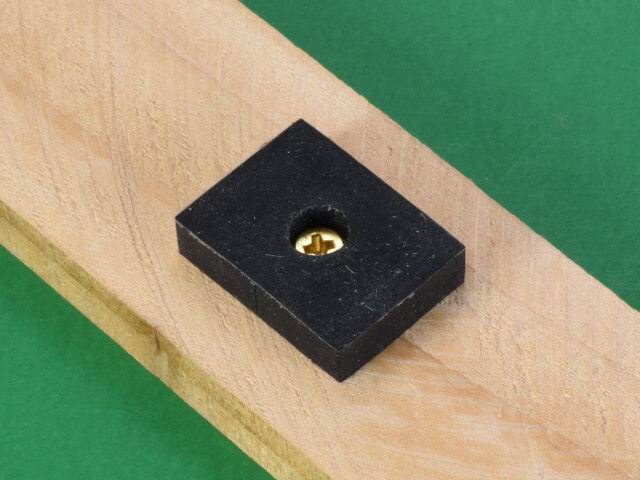 If you're hanging a thick wooden frame, one or more of these magnets can be screwed directly to the back of a frame using common wood screws. Wood screws available from the local hardware or home improvement store work well. What if your frame is thin? Or made of metal? What if you can’t drive a screw into the back of it? 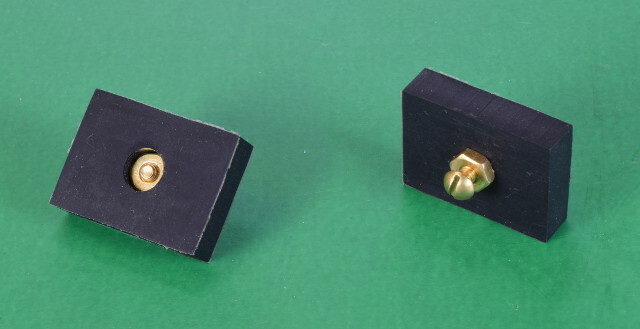 The simple hole in these magnets allows all sorts of solutions using commonly available hardware. With a little creativity, you could find all sorts of ways to use these magnets. To mount a picture frame that already has some kind of hanging feature on the back, a nut and screw can be assembled onto the magnet. A picture frame can be hung on the screw just as you would hang it on a screw in the wall. A word of caution: When stuck to a sturdy steel door, we found these magnets quite difficult to remove by hand! They're thin, so it's hard to get a good grip on them. We had to grab the screw with a pliers to get them off! How strong are these magnets? How much can they hold? As with any magnet, the amount of weight you can hang with it depends on what you’re sticking it to and how you use it. The Pull Force numbers we list describe the force required to pull a single magnet straight away from a big, thick steel plate. While that’s a great measure of strength, it’s not the same thing as how much the magnet can hold to your steel front door. To get some decent estimates, we stuck each of these magnets onto a few vertical surfaces. We applied the force to pull down, attempting to slide the magnet down the face of the vertical surface. The results are less than the official pull force to a big steel plate, but provide a more realistic estimate when used on a wall. These are tests we tried ourselves on surfaces we had available here. As they say, your results may vary. We noticed differences depending on which steel door we tried it on! Of course, magnets can help hang up more than just picture frames. In a previous holiday season, we recommended our WPH-LG Magnetic Hooks to hang a wreath to a steel door in our Christmas Wreaths article. They work great! Many of us are pulling them out again this holiday season. Naturally, we wondered how these new magnets would work. While they don’t have a built in hook, adding some screws to attach the wreath worked quite well. We still like those plastic hooks for wreaths, but this could be another solution. 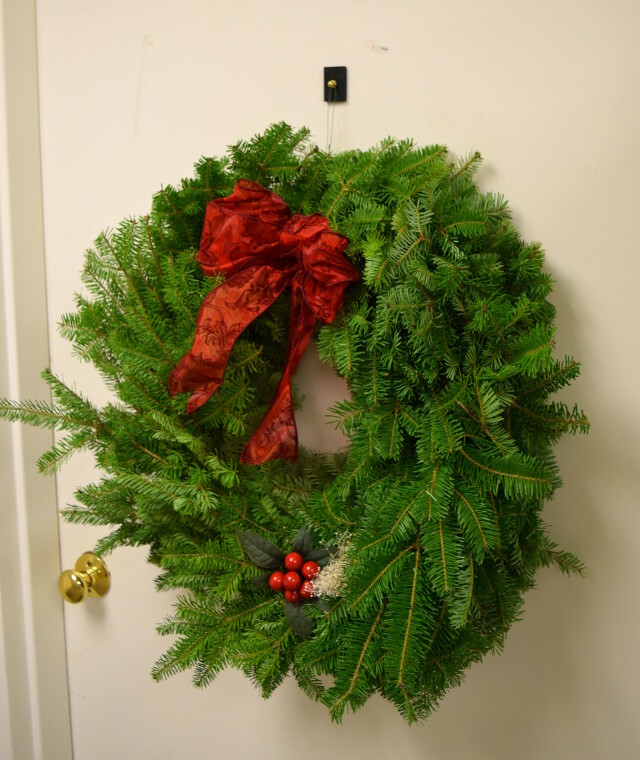 Thanks again to the wonderful folks at Wreaths of Maine for another beauty! A set of blinds held to a steel door with 3 RMB-B-Y0 magnets. 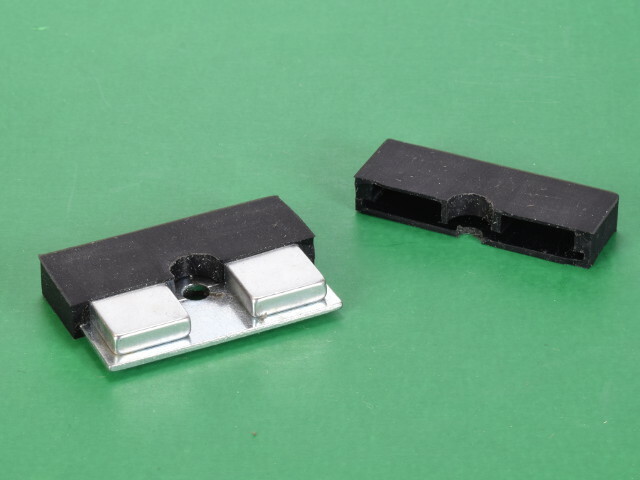 Over the years, many customers have asked us about magnets to hang blinds on a steel door. It’s a great idea, especially when you don’t want to make permanent holes in a door. It can be a tough challenge to pick the right magnets. The weight of the blinds plus the force you pull down on the string can tend to rotate the magnets away from the door. As described in our Leverage & Friction article, it's easy to rotate magnets away from the surface, even with powerful magnets. This is especially true if the blinds stick out from the door a lot. The challenge is finding magnets that will hold well enough without being dangerously powerful. We knew we just had to give these great magnets a try. We attached three of the large, 2” RMB-B-Y0 magnets to the back of some cheap blinds we had lying around. We attached the magnets with screws. We were pleasantly surprised at how well they work. They even stayed in place when tugging on the string! It’s possible to slide them down a bit with a hard enough tug, but we didn’t find it unreasonable.